Home Made of Clay is one of those Etsy shops which just makes you smile when looking through it. All the cute crafty makes on there are just what you need to add the finishing touch to your homes, especially at Christmas time! 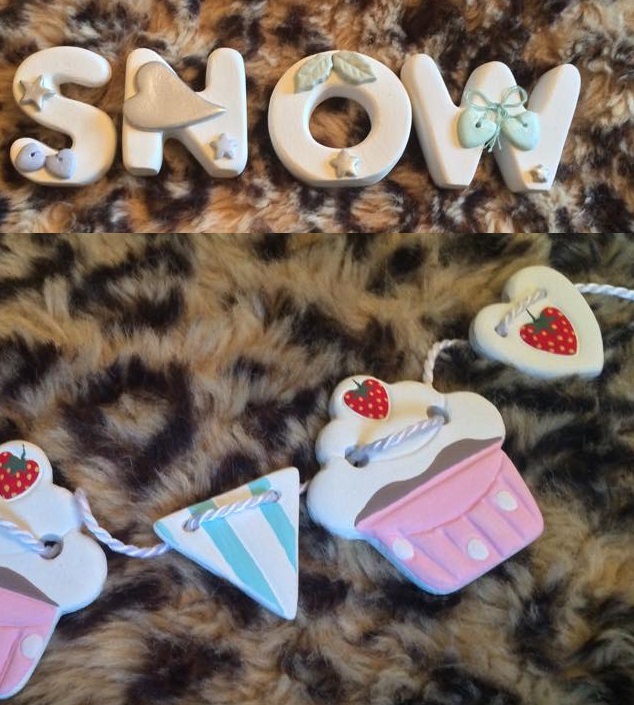 ..And there's lots of cute Christmas decorations on there at the moment. Home Made of Clay has kindly sent me some bits to show you guys and give my honest opinion on, and some are Christmas-themed which is so exciting. I love Christmas, and I especially love dressing the house up. The first thing I saw when I opened the box were some free-standing clay letters. I was slightly puzzled as I hadn't seen these on her shop and they were wrapped up separately and I couldn't make out what they spelled until I unwrapped them and put them in order. How adorable are they!? The word 'Snow' can be displayed from November-ish really as well and I'm always looking for an excuse to display my Christmas decs early so this is great. They're absolutely precious and she also sells 'Noel', 'Bake' and 'Xmas'. There's a Christmas version of 'Bake' and an all-year round version on there at the moment and they're both beautiful - I think it's really interesting how different you can make one word look... but I'm rambling now.. The point is, definitely check the free-standing letters out - they're to die for! The next thing I pulled out was the most beautiful handmade clay cupcake bunting. This is so unique, I haven't seen anything like this before. The cute little clay cupcakes and flags are so pretty, this will look lovely in my home. I will hang this in my entrance hall I think, to welcome everyone into my home! The detail on there is very intricate - I love the detail on there, Fiona has certainly got some talent! I then opened a gorgeous hanging decoration with a Christmas pudding on there. 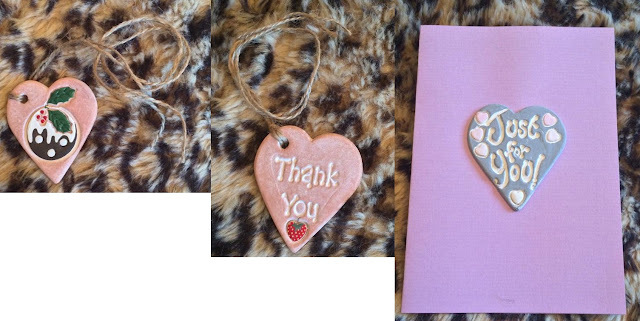 This is cute, it will look lovely on my tree - I like having little one-off pieces on there. It has a hessian tie which I always love as it looks really rustic. Fiona also sent me a little hanging heart with 'Thank You' on there - this is cute and will make a nice gift for someone when they've done something for me. I always like to surprise people with gifts when they've done something lovely and not expected anything for it. These cute little hearts are perfect for those random acts of kindness! With my package, Fiona also wrote me a hand-made card with a clay heart on the front. How gorgeous is it!? She sells these on her shop as well and they're so reasonably priced! Check out Home Made of Clay here, her little creations are so pretty and thoughtfully made.